In the recently published fourth edition of Deloitte’s Global Robotics Report the research on Robotic Process Automation exposes some interesting insights into the development of the drivers for RPA within organisations . Evidence that suggests automating at scale is not growing as predicted. The benefits of automation are now clear. The adoption of some form of automation within organisations is either on the roadmap or in pilot stage for many large businesses. However the drivers for this automation are changing. In 2016/17 the main perceived benefit of RPA was cost reduction, with significant ROI being made due to the fast implementation of RPA. However, following the survey of more than 500 people from global organisations it has become apparent that this priority has shifted. 38% now list increased productivity as the main priority for automation. More than 90% of organisations said that RPA had exceeded it expectations in productivity, improved compliance and cost to implement. Over 80% said implementing or scaling RPA had led to a happier workforce. Improved customer experience followed as the second highest priority for automation at 18%. This was defined by reduced processing times and improved accuracy, resulting in customers receiving an improved and more consistent service. But the growth of automation has not followed the predicted path from 2017. Scaling automation is proving to be problematic. There has only been a 1% increase in organisations achieving fully scaled automation. Only a few organisations have been able to scale their robotic efforts quickly while others struggle to get beyond their pilot projects. Whilst proof of concept and pilot projects are an excellent way to start an automation journey, some companies are falling foul of the process fragmentation exposed when looking beyond simple task automation, and have therefore slowed their automation journey. This results in bots being underused, therefore reducing their potential to impact via automation. Other limiting factors are lack of IT readiness; there can be a slow buy-in from IT teams due to concerns regarding integration with current systems, and the understanding of the differences with rapid, non-invasive RPA deployment in comparison with traditional workflow systems that can be both resource and time intensive. But this isn’t the story for every business. EDF Energy, the largest supplier of low-carbon electricity in the UK, recently adopted a full scale automation project from just one robot in its financial shared services centre. They had seen the success of a back office automation project for Customer care and decided to purchase a single robot and deploy it. Within 4 weeks they had their proof of concept robot running. Robert Gilhooly, Director of Financial Shared service centre said ‘UiPath allowed us to purchase a single Robot and then add Robots one at a time after that. This made it very affordable for us to move into proof of concept and pilot stages quickly’. 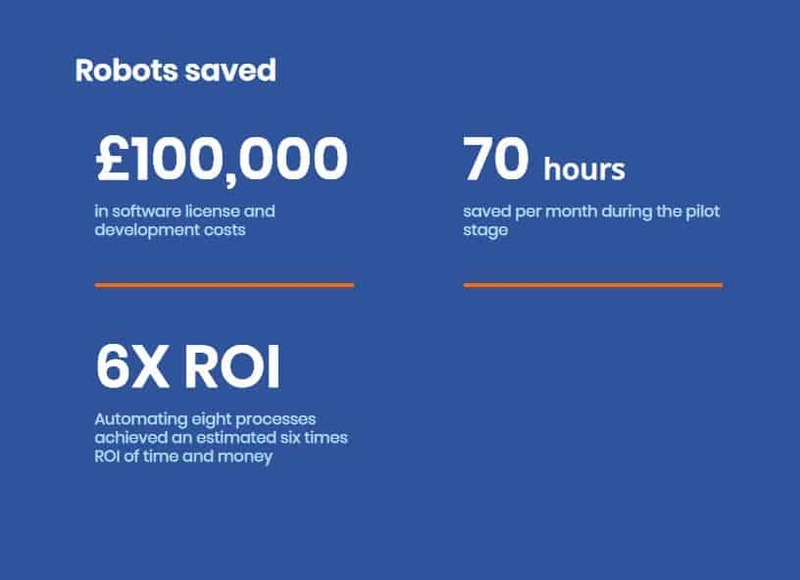 6 months on they have automated 8 processes and achieved an 6x ROI in time and money and are looking to automate processes in HR and IT using the same method of one robot at a time. Having a clear ‘robot vision’ for the organisation across all departments will help ensure successful scaling of automation and achieve desired outcomes for the organisation and avoid the roadblocks which have prevented some organisations from realising the full benefits of RPA.